Glenn Greenwald has just announced he is nearly finished witing a book on Bush's subverting America's values, specifically by engaging in the felonious act of using the NSA to illegally spy on Americans. As he says, "...is not and has never been about the scope of eavesdropping powers which the Government ought to have." Roughly six weeks ago, I was approached by an editor with a proposal to publish a book based on the ideas and arguments which have been the subject of this blog for the last several months. 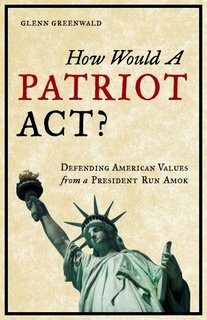 The idea was to get the book to the market quickly in order for it to have as much of an impact as possible on the current, ongoing and now (thanks to Russ Feingold) intensifying debate over the NSA scandal specifically and, even more so, the radical theories of law-breaking power embraced by the Bush Administration generally. And readers of this blog know, Glenn is preaching to the choir here. I've lamented about, ok, gone into profanity laced rages over what Bush has been doing to our heritage and the very nature of our country.